Meditation: What is the greatest rule of life? What is the purpose of God's law and commandments? The Pharisees prided themselves in the knowledge of the law of Moses and the ritual requirements of the law. They made it a life-time practice to study the 613 precepts of the Torah - the books of the Old Testament containing the Law of Moses - along with the numerous rabbinic commentaries on the law. The religious authorities tested Jesus to see if he correctly understood the law as they did. Jesus startled them with his profound simplicity and mastery of the law of God and its purpose. Jesus summarized the whole of the law in two great commandments found in Deuteronomy 6:5 - "You shall love the Lord your God with all your heart, and with all your soul, and with all your might" - and Leviticus 19:18 - "you shall love your neighbor as yourself". God's love directs all that he does - His love is holy, just, and pure because it seeks only what is good, beneficial, and life-giving - rather than what is destructive, evil, or deadly. That is why he commands us to love - to accept what is good, lovely, just, and pure and to reject whatever is contrary. God is love and everything he does flows from his love for us. God puts us first in his thoughts and concerns - do we put him first in our thoughts? God loved us first and our love for him is a response to his exceeding goodness and kindness towards us. The love of God comes first and the love of neighbor is firmly grounded in the love of God. The more we know of God's love, truth, and goodness, the more we love what he loves and reject whatever is hateful and contrary to his will. God commands us to love him first above all else - his love orients and directs our thoughts, intentions, and actions to what is wholly good and pleasing to him. He wants us to love him personally, wholeheartedly, and without any reservation or compromise. Love is the gift of oneself for the sake of others - it is wholly other oriented and directed to the welfare and benefit of others. Love which is rooted in pleasing myself is self-centered and possessive - it is a selfish love that takes from others rather than gives to others. It is a stunted and disordered love which leads to many hurtful and sinful desires - such as jealousy, greed, envy, and lust. The root of all sin is disordered love and pride which is fundamentally putting myself above God and my neighbor - it is loving and serving self rather than God and neighbor. True love, which is wholly directed and oriented to what is good rather than evil, is rooted in God's truth and righteousness (moral goodness). God loves us wholly, completely, and perfectly for our sake - there is no limit, no holding back, no compromising on his part. His love is not subject to changing moods or circumstances. When God gives, he gives generously, abundantly, freely, and without setting conditions to the gift of his love. His love does not waver, but is firm, consistent, and constant. He loves us in our weakness - in our fallen and sinful condition. That is why the Father sent his only begotten Son to redeem us from slavery to sin and its disordered cravings, desires, passions, and addictions. God the Father always seeks us out to draw us to his throne of mercy and help. God the Father corrects and disciplines us in love to free us from the error of our wrong ways of thinking and choosing what is harmful and wrong rather than choosing what is good and wholesome for us. Do you freely accept God's love and do you willingly choose to obey his commandments? How can we possibly love God above all else and obey his commandments willingly and joyfully, and how can we love our neighbor and willing lay down our life for their sake? Paul the Apostle tells us that "God's love has been poured into our hearts through the gift of the Spirit which has been given to us" (Romans 5:5). We do not earn God's love - it is freely given to those who open their heart to God and who freely accept the gift of the Holy Spirit. Ask the Lord Jesus to flood your heart with his love through the gift of the Holy Spirit. What makes our love for God and his commands grow in us? Faith in God and hope in his promises strengthens us in the love of God. They are essential for a good relationship with God, for being united with him. The more we know of God the more we love him and the more we love him the greater we believe and hope in his promises. The Lord Jesus, through the gift of the Holy Spirit, gives us a new freedom to love as he loves. Do you allow anything to keep you from the love of God and the joy of serving others with a generous heart? Paul the Apostle says: hope does not disappoint us, because God's love has been poured into our hearts through the Holy Spirit which has been given to us (Romans 5:5). Do you know the love which conquers all? 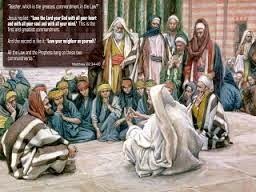 When the Pharisees heard that Jesus had silenced the Sadducees, they gathered together, and one of them a scholar of the law tested him by asking, "Teacher, which commandment in the law is the greatest?" He said to him, "You shall love the Lord, your God, with all your heart, with all your soul, and with all your mind. This is the greatest and the first commandment. The second is like it: You shall love your neighbor as yourself. The whole law and the prophets depend on these two commandments." Introductory Prayer: Dear Lord, I believe in you, because you have a plan for me that will bring me to be like you. I hope in you, because your example and your grace give me the strength to be able to identify my will with yours. I love you, because only by loving you can I be transformed into you and be holy. Petition: Give me, Lord, the grace to practice charity faithfully. 1. Wanting What God Wants: What is true love? Quoting the Roman historian, Sallust, Pope-Emeritus Benedict XVI shows us what the authentic content of love is: “To want the same thing, and to reject the same thing was recognized by antiquity as the authentic content of love: the one becomes similar to the other, and this leads to community of will and thought” ( Deus Caritas Est , 17). This quote helps us understand that to love is to identify our will with God’s will. This leads us to be like God. This fact corrects the error of our first parents who disobeyed God. 2. Love Has Two Dimensions: True love has two dimensions: love for God and love for our neighbor. The first epistle of John, known as the “Magna Carta” of charity, expresses frequently and clearly the close relationship between them. One cannot exist without the other: “No one who fails to act in righteousness belongs to God, nor anyone who does not love his brother” (1 John 3:10); “Beloved, let us love one another, because love is of God; everyone who loves is begotten by God and knows God” (1 John 4:7); “Beloved, if God so loved us, we also must love one another” (1 John 4:11); “If anyone says, ‘I love God,’ but hates his brother, he is a liar; for whoever does not love a brother whom he has seen cannot love God whom he has not seen. 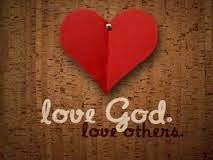 This is the commandment we have from him: whoever loves God must also love his brother” (1 John 4:20-21). 3. Loving Others: Loving God requires loving others. This is not easy, especially in a world that highly esteems individualism and permits stepping on others to get ahead. If loving others according to the Old Testament requirement, “as you love yourself” is difficult, we can imagine how difficult it is to love others according to Christ’s requirement, “as I have loved you” (cf. John 13:34), which is a true Christian’s hallmark: “This is how all will know that you are my disciples, if you have love for one another” (John 13:35). How many times do we judge only from appearances or judge people only by their physical traits or defects? It’s so easy to comment on peoples’ defects, imperfections, and ways of acting; yet, it is so difficult to praise constantly what is positive in them. One of the best ways to love our neighbor is to seek charity in speech. Conversation with Christ: Dear Jesus, give me the grace to love others with all my effort and good will. I want to contemplate you, Lord, so that I may learn from you how to love them to the point of giving my life for them. Resolution: I will practice charity towards others in a very concrete way. KEY VERSE: "The whole law and the prophets depend on these two commandments" (v 40). READING: The Pharisees believed in the divine authority of the written Hebrew Scriptures ("the law and the prophets," v 40) as well as the oral interpretations of the law. These included 613 precepts that were divided into categories of greater or lesser importance. The Sadducees, on the other hand, accepted only the first five books of the law (the Pentateuch) and rejected oral tradition, including the belief in angels and the bodily resurrection. Both groups were opposed to Jesus. A scribe, an expert in the law, challenged Jesus by asking which law was greater than the others. Jesus summed up the entire law with two commands upon which the whole law was based: “You must love the Lord your God with all your heart, with all your soul, and with all your mind" (Dt 6:5) and "You must love your neighbor as yourself” (Lv 19:18). Jesus thereby put the love of God on a par with love of neighbor. Only by loving oneself, will we be able to start loving other people as the Lord commanded. Jesus perfectly fulfilled this law of love in his words and deeds. REFLECTING: Do I have a healthy self-love? PRAYING: Lord Jesus, fill me with love for you so that it will overflow to others. On October 11, 1954, four years after he declared the dogma of the Assumption of Mary, Pope Pius XII, in an encyclical letter, Ad Caeli Reginam, decreed and instituted the feast of the Queenship of the Blessed Virgin Mary. He formalized the Church's tradition from the earliest centuries, which rested on both Holy Scripture and tradition. The coronation of Mary as Queen of Heaven fulfilled more than her own prophecy that "all generations will call me blessed." Her ancestor Judith's actions anticipated hers: "O daughter, you are blessed by the Most High God above all other women on earth; and blessed be the Lord God, who created the heavens and the earth . . . Your praise will never depart from the hearts of those who remember the power of God [Jud 13:18, 19]." On another level, it prophesizes the triumph of Mary yet to come. At the end of the world, Mary, crowned with twelve stars, will crush the head of the serpent beneath her feet [Rev 12:1-18]. 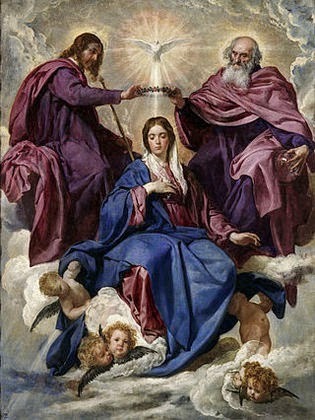 Pope Paul VI wrote, "The Solemnity of the Assumption is prolonged in the celebration of the Queenship of the Blessed Virgin Mary, which occurs seven days later. On this occasion we contemplate her who, seated beside the King of ages, shines forth as Queen and intercedes as Mother" (Marialis Cultus - For the Right Ordering and Development of Devotion to the Blessed Virgin Mary - 2 February 1974). Lord, you ask us to love you totally and to love others as ourselves. Because I am selfish, I fail often to love you as you deserve and to give to others the love they need from me. In a vision, your prophet Ezekiel saw you breathing new life into the dry bones of a people loved by you but unfaithful to you. Despite my weakness, you love me. St Paul teaches that you wish to breathe your love into my unresponsive heart: ‘The love of God is poured into our hearts by the Holy Spirit who is given to us.’ Lord, help me to resist the selfish desires that press on me so strongly. By your Holy Spirit, teach me to desire you above all else, and to share your love with others, especially those closest to me. In the fourth century St. Ephrem (June 9) called Mary “Lady” and “Queen.” Later Church fathers and doctors continued to use the title. Hymns of the 11th to 13th centuries address Mary as queen: “Hail, Holy Queen,” “Hail, Queen of Heaven,” “Queen of Heaven.” The Dominican rosary and the Franciscan crown as well as numerous invocations in Mary’s litany celebrate her queenship. The feast is a logical follow-up to the Assumption and is now celebrated on the octave day of that feast. In his 1954 encyclical To the Queen of Heaven, Pius XII points out that Mary deserves the title because she is Mother of God, because she is closely associated as the New Eve with Jesus’ redemptive work, because of her preeminent perfection and because of her intercessory power. “Let the entire body of the faithful pour forth persevering prayer to the Mother of God and Mother of men. Let them implore that she who aided the beginnings of the Church by her prayers may now, exalted as she is in heaven above all the saints and angels, intercede with her Son in the fellowship of all the saints. May she do so until all the peoples of the human family, whether they are honored with the name of Christian or whether they still do not know their Savior, are happily gathered together in peace and harmony into the one People of God, for the glory of the Most Holy and Undivided Trinity” (Vatican II, Dogmatic Constitution on the Church, 69). Mary said, 'You see before you the Lord's servant, let it happen to me as you have said.' And the angel left her. 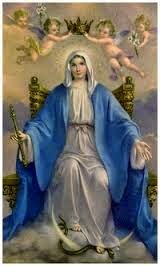 • Today is the Feast of Mary Queen. The text of the Gospel on which we meditate describes the visit of the angel to Mary (Lk 1, 26-38). The word of God comes to Mary not through a Biblical text, but rather through a profound experience of God, manifested in the visit of the Angel. In the New Testament, many times, the Angel of God is God himself. It was thanks to the meditation on the written Word of God in the Bible that Mary was capable to perceive the living Word of God in the visit of the Angel. The same thing happens today with God’s visits in our life. The visits of God are frequent. But because of lack of assimilation and meditation of the written Word of God in the Bible, we are not aware of God’s visit in our life. The visit of God is so present and so continuous that, many times, we do not perceive it and, because of this, we lose a great occasion to live in peace and with joy. • Luke 1, 26-27: The word enters into our life. Luke presents the persons and the places: a Virgin called Mary, betrothed to a man called Joseph, of the House of David. Nazareth was a small city in Galilee. Galilee was in the periphery. The centre was Judah and Jerusalem. The Angel Gabriel was sent by God to this young virgin who lived in the periphery. The name Gabriel means God is strong. The name Mary means loved by Yahweh or Yahweh is my Lord. The story of the visit of God to Mary begins with the expression: “In the sixth month”. It refers to the “sixth month” of pregnancy of Elizabeth, relative of Mary, a woman of a certain age, who needs help. The concrete need of Elizabeth serves as a background to the whole episode. It is found at the beginning (Lk 1, 26) and at the end (Lk 1, 36.39). • Luke 1, 28-29: Mary’s reaction. The angel had appeared to Zechariah in the Temple. The Angel appears to Mary in her house. The Word of God reaches Mary in the environment of her daily life. The Angel says: “Rejoice, you who enjoy God’s favour! The Lord is with you!” These are words similar to those which were said to Moses (Ex 3, 12), to Jeremiah (Jr 1, 8), to Jedeon (Jz 6, 12), to Ruth (Rt 2, 4) and to many others. These words open the horizon for the mission which these persons of the Old Testament have to carry out in the service of the People of God. Deeply disturbed by this greeting, Mary tries to understand what it means. She is realistic, she uses her head. She wants to understand. She does not simply accept any apparition or inspiration. • Luke 1, 30-33: The explanation of the angel. “Do not be afraid, Mary!” This is always the first greeting of God to human beings: do not be afraid! Immediately after that, the angel recalls the great promises of the past which will be realized through the son who will be born from Mary. This son must receive the name of Jesus. He will be called the son of the Most High and in him finally, will be realized the Kingdom of God promised to David, which all were anxiously waiting for. This is the explanation which the Angel gave to Mary so that she would not be afraid. • Luke 1, 34: New question asked by Mary. Mary becomes aware of the important mission which she is about to receive, but she continues to be realistic. She does not allow herself to be transported by the greatness of the offer and looks at her condition.” But how can this come about? I have no knowledge of man”. She analyses the offer according to criteria that we, human beings, have available. Because, humanly speaking, this was not possible that this offer of the Word of God would be realized at that moment. • Luke 1, 38: Mary gives herself. The response of the angel clarifies everything for Mary. 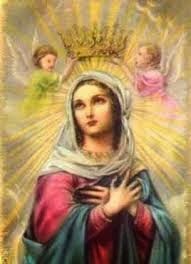 She gives herself to what the angel was asking for: “Behold, the handmaid of the Lord! May it be done to me according to your word”. Mary calls herself Servant, handmaid of the Lord. This title comes from Isaiah, who presents the mission of the people not as a privilege, but rather like a service to others (Is 42, 1-9; 49, 3-6). Later, the son who was about to be generated at that moment, will define his mission saying: “I have not come to be served but to serve!” (Mt 20, 28). He learns from his Mother! • Luke 1, 39: The way that Mary finds to render service. The Word of God reaches Mary and makes her get out of self in order to serve others. She leaves the place where she was and goes toward Judah, at a distance of more than four days journey, in order to help her cousin Elizabeth. Mary begins serving and fulfils her mission in behalf of the People of God. • How do you perceive God’s visit in your life? Have you been visited already? Have you been a visit from God in the life of others especially for the poor? How does this text help us to discover the visits of God in our life? • The word of God became incarnate in Mary. How is the Word of God taking flesh in my personal life and in the life of the community? for his wonders for the children of Adam!